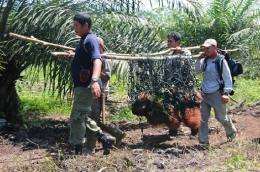 This handout photo taken on October 14 and released by the Sumatran Orangutan Conservation Programme (SOCP) shows government wildlife and SOCP personnel recovering a fully grown male adult orangutan during a rescue operation in a pocket of Indonesian forest. The disappearance of the trees has pushed thousands of animals—from the birds they harbour and sustain to orangutans, gibbons and black panthers—out of their natural homes and habitats. "We don't see too many orangutans any more", said a worker with a weather-beaten face, taking a break in the shade of a hut built on a path gouged out of the forest floor. Experts believe there are about 50,000 to 60,000 orangutans left in the wild, 80 percent of them in Indonesia's Borneo and the rest in Malaysia. Exact data on their decline is hard to come by, say primatologists. "What we see now is a contest between orangutans and palm oil for a home," said Sri Suci Utami Atmoko from National University in Jakarta. "You can judge that the population is depleting from the loss of orangutan habitats." "There are 100,000 gibbons in Borneo. But in 15-20 years, there will be more viable populations," said Aurelien Brule, a French national based in Borneo for 15 years who runs an animal sanctuary. Gibbons rescued from the destruction of their forest homes cannot be returned alone into new wild habitats. "Other pairs protecting their own territory would kill them," said Brule, adding that rampant deforestation has wiped out sites suitable for single animals. A bulldozer that is used in clearing forest land for palm oil plantations in Borneo. The roar of chainsaws has replaced birdsong, the once-lush, green jungle scorched to a barren grey. The equivalent of six football pitches of forest is lost every minute in Indonesia. "Palm oil has brought fortune to Indonesia, but it has been gained with blood," said Jakarta-based forest campaigner for Greenpeace, Wirendro Sumargo. Indonesia, the world's biggest palm oil producer, has exponentially increased the land dedicated to the commodity from 274,000 hectares (680,000 acres) in the 1980s to 7.32 million hectares in 2009, government documents show. The industry has helped push Indonesia's GDP growth rate above 6.0 percent every year since 2005, but at the cost of huge tracts of rainforest. Despite some backlash around the world, including an unsuccessful attempt in France to push an amendment to quadruple tax on palm oil to discourage consumption—the destruction is unlikely to stop any time soon. In this area, "we have evidence that five palm oil firms are doing illegal practices", said Deddy Ratih, forest campaigner for WALHI/Friends of the Earth Indonesia. Derom Bangun, the chairman of umbrella organisation the Indonesian Palm Oil Board, doesn't deny the issue but says improvements are being made. "The government has seen (the violations) and has taken steps to fix it. 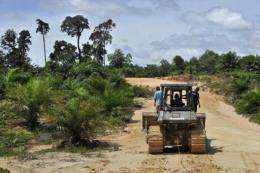 Ultimately we want the palm oil industry to work according to the rules," he added. "Generally land allocation for plantations still overlaps with primary forests and peatlands, including in areas that are the habitat of key species," said Irwan Gunawan, WWF deputy director of market transformation in Indonesia. "We are encouraging the government to pay attention to this," he added. ... and they are doomed.